Between 2003 and 2009, residents in Sarasota County waterfront communities initiated 23 projects involving the dredging of their waterways to maintain navigability. Seven of the projects gained the necessary support of 67 percent of the affected homeowners, as required by county ordinance, so they could proceed. However, in 2009, the Sarasota County Commission voted to raise the necessary approval level from that 67-percent mark to 80 percent. And since then, only one community — along Bayshore Drive in Englewood — “has generated the necessary 80 percent [of] petition signatures to proceed to the feasibility phase,” the chairman of the county’s Waterway Advisory Council told the County Commission last month. On the basis of the council’s recommendation, the board voted 3-2 to hold a public hearing to consider lowering the threshold to the original 67-percent level. Then-Chair Carolyn Mason and Commissioner Christine Robinson were in the minority. Both said they felt county staff needed to undertake outreach to residents along waterways and allow the board to discuss those responses before setting a public hearing. The commission should not hold off any longer on the public hearing, he added. 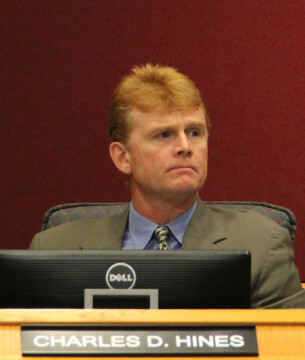 Nonetheless, on Feb. 17, staff will appear before the board for a discussion item first, county spokesman Drew Winchester told The Sarasota News Leader this week, to present the findings of research into the history behind the threshold change. Commissioner Charles Hines sought such a report when he made the Dec. 9 motion that he, Maio and Commissioner Paul Caragiulo supported. 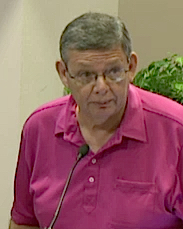 Although Hines argued then that a public hearing could be held on the basis of the commissioners’ review of a written report prior to the meeting, Winchester added that staff will ask the board on Feb. 17 whether it wants to have a public hearing advertised. If the vote is to hold a hearing, Winchester said, that proceeding will be scheduled. He pointed to the “owner-driven approval process” for projects, noting that when an undertaking is completed, “the properties that benefit from the project” are assessed the expense of it over a period of years. Between 2009 and 2014, he continued, not a single project was initiated under the program, so the Council members in 2014 and this year worked to identify “what fundamentally changed in 2009” that prompted that result. Three factors were found to have had an effect, Thornton said: the Great Recession; a diminishment of public awareness of the program over time; and the change in the approval threshold from 67 percent to 80 percent in 2009. In the wake of that mailing, Thornton said, county staff received 103 inquiries about projects. Paul Semenec, a member of the county’s Public Works Capital Projects staff and the Council’s liaison, followed up on all of the inquiries, Thornton added. As a result, 14 community groups were formed, and petitions were presented to them in the effort to move projects to the feasibility stage, he told the board. Yet, only the Englewood initiative gained the necessary level of support to proceed. Council members have concluded that the 80-percent mark is “unrealistically high and punitive to a majority of homeowners who may wish to proceed with a project,” Thornton told the board. “We fear that such a high hurdle may discourage other interested communities with impaired canals from even attempting such [an initiative].” Two landowners could derail a project involving nine pieces of property, he noted. Therefore, he continued, the Council members recommended the County Commission reduce the level to the 67-percent mark. In response to a question from Robinson, Semenec explained that after work began on several dredging projects in 2007, the County Commission “heard a lot of complaints from the property owners who did not vote for the projects,” especially after the assessments were set. As a result, Semenec continued, the commission asked for a staff discussion of the situation. Following that, he added, the board voted to raise the percentage to 80. 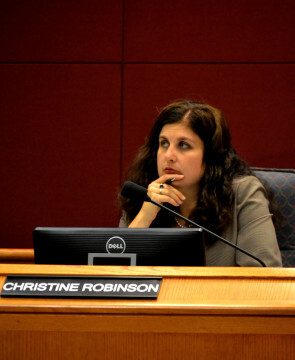 “Do we have any other taxing districts that require a percentage over 67 percent?” Robinson asked. Semenec replied that neighborhood-initiated water and sewer projects must have 80 percent of the property owners’ agreement before they can proceed. After Hines said he also was in favor of the advisory council’s recommendation, Mason asked for a motion. Hines then called for a public hearing to consider reducing the percentage from 67 to 80. In advance of that proceeding, he asked that staff undertake research into the history of the change in the threshold and look into what other communities are doing as well. However, she told her colleagues she did not mean that as an indication she would vote against lowering the threshold. Mason concurred with the need for public outreach. 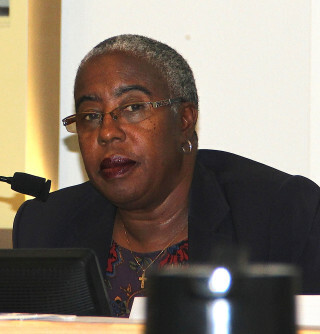 When she asked Hines whether he intended such action as part of his motion, he replied that he thought at least three of the commissioners were inclined to support going ahead with scheduling the public hearing. Robinson reminded him that the board normally holds a discussion of a matter and calls for staff communication with the public before setting a hearing on an issue. 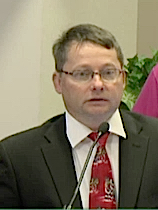 When Hines then asked County Administrator Tom Harmer about how long it would take to schedule the public hearing if Hines’ motion passed, Harmer responded that it probably would be at least 60 days. Hines referenced Thornton’s comment about the letters sent to the public about the waterway program, adding that he felt the staff report on the history behind the threshold change would be sufficient background for the board before the public hearing. When Mason called for the vote, she joined Robinson in opposing the motion, leaving it to pass 3-2.